LOS ANGELES – Manny Pacquiao wrapped up a grueling seven-city international media tour that spanned over 23,000 miles in Los Angeles Thursday afternoon at the lavish Beverly Hills Hotel to promote his Nov. 23 PPV bout against Brandon Rios. This will be Pacquiao’s first fight since being brutally knocked out by Juan Manuel Marquez last December. “I need to prove that I can still fight and that my boxing career is not done yet, and to get back the lost confidence of my fans,” Pacquiao said. Hall of Fame trainer Freddie Roach said Pacquiao (54-5-2, 38 KOs) will go back to his homeland Philippines and begin a six-week training camp prior to the fight. “Rios is game and throws punches from odd angles. He swings a lot. He likes to trade and exchange. I think Manny Pacquiao has straight, sharp punches who moves too fast for him to handle,” said Roach. The non-title bout is contracted at the welterweight limit of 147 pounds and will take place at the The Venetian Macao’s CotaiArena. This will already be Bob Arum and Top Rank’s third Macau promotion this year; the first two were headlined by Chinese Olympian Zou Shiming, who’ll this time be featured as an undercard attraction. Rios (31-1-1, 22 KOs), a former world champion from Oxnard, Calif., will be returning to the ring following his “Fight of the Year” candidate loss to Mike Alvarado in March. Rios has fought outside the U.S. only once. For Pacquiao, boxing’s only eight-division world champion, this marks his first fight outside the U.S. since 2006, which took place in the Philippines. 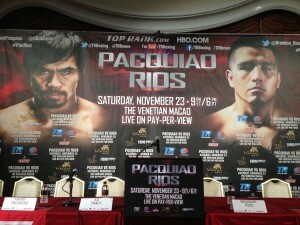 The Pacquiao-Rios media tour began last week in Asia and included stops in Macau, Beijing, Shanghai and Singapore. This week, they made stops at the ESPN headquarters in Bristol, Conn., then a press conference in New York, and finally, a record-breaking turnout of 327 media members in Los Angeles. The extravaganza will be produced and distributed live by HBO Pay-Per-View, beginning Nov. 23 at 9:00 p.m. ET / 6:00 p.m. PT.